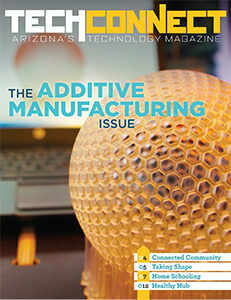 The Spring 2017 edition of the magazine, “The Additive Manufacturing Issue,” is a deep-dive into the world of additive manufacturing in Arizona. Discover what local industry leaders are accomplishing with 3D printing and learn about their aspirations for the future as experts continue to realize the great potential of additive manufacturing. You can access and download our Spring 2017 edition of TechConnect, “The Additive Manufacturing Issue” here. To submit story ideas and learn about advertising opportunities, send an email to drodriguez@aztechcouncil.org.